The density of states (DOS) of a system describes the number of states per interval of energy at each energy level available to be occupied. It is mathematically represented by a density distribution and it is generally an average over the space and time domains of the various states occupied by the system. This type of plots are very common in our area of investigation. 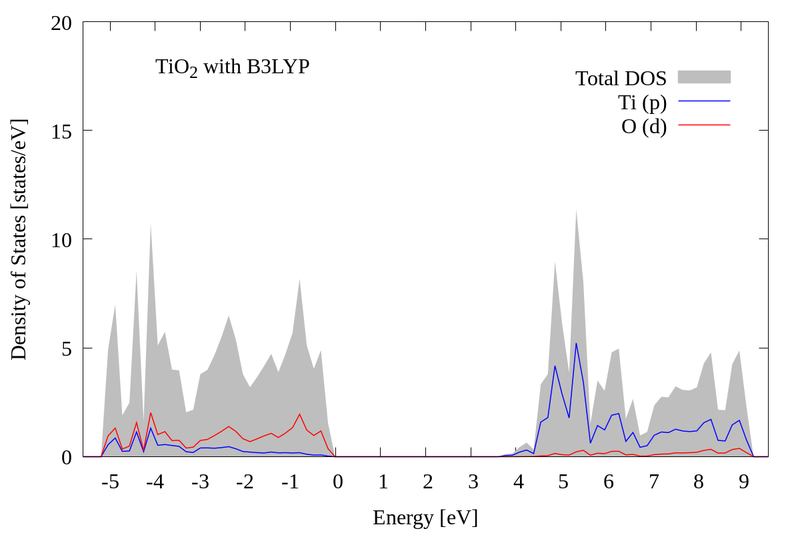 But to plot it is not so easy, first you have to split total DOS in partial atomic density. This require time and creativity, here we show some tips and tricks to acomplish this task. First we are going to show how to make a partial DOS, and then a multiplot of DOS's. Now to plot the density of states create a new directory and copy the b3lyp_tio2.dat file to this directory. First column is the energy in Hartree, second are the total sum of states, the third are the Ti (d) contributions, and the fourth are the O (p) contributions. 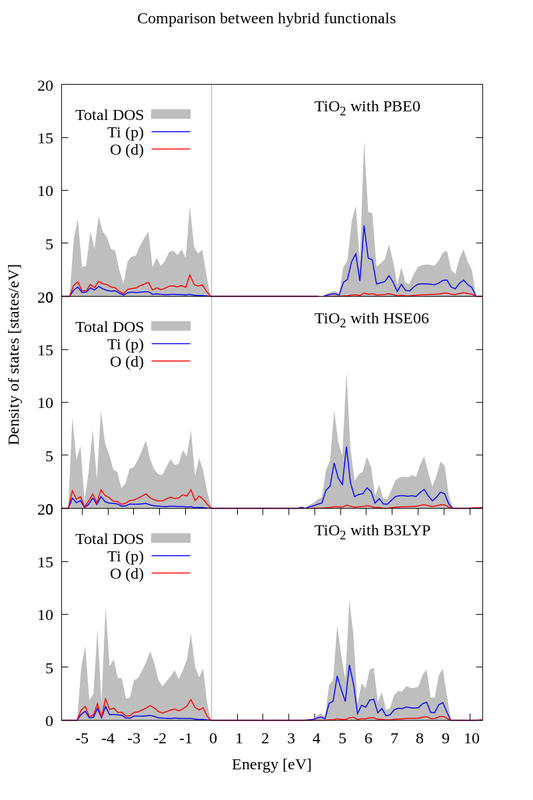 Use the general gnuplot template and modify the data you want to plot, in this case we are plotting the total density of states, and the contribution by Ti (d) and O (p) orbitals. You can download this gnuplot template here: doss_single.p. It will generate a png image. The FAMAlab investigates the electronic properties of pure and doped materials, adsorbed molecules on material surfaces as well as using functional differens for descrive the elctronic properties. So making comparisons between different plots is very common. You can download the multiplot template here: doss_multiplot.p. It will generate a png image.